Hey everyone I am Sally or Splendid Spaloh with my first guide! Today I will be explaining one of the key decks of the new meta as both the princes are buffed and ready to roll! Needs a lot skill when it comes to tracking elixir. Pekka is the main tank/killer of the deck, it is going to be bursting the every enemy troop with the princes and a single hit will be a huge part of the tower’s health. Make sure you play this card at the back during double elixir to start building up the huge amounts of damage that the push will have once it has reached it’s peak. Pekka is also reliable on destroyed many high health tanks and a good counter to X-Bow decks so you may play her defensively and make pushes with the Princes. Since we don’t have Pump in the deck we need to be careful with our elixir on this card, make sure that your opponent is not at peak elixir too or else they may punish us with a small push. The ground splash unit has received a buff like his brother in the recent patches, this makes him even better in double prince decks with the combination even stronger than it already is. He will be our early game mini-tank, canceling small pushes such as rams, small chippers and squishies. 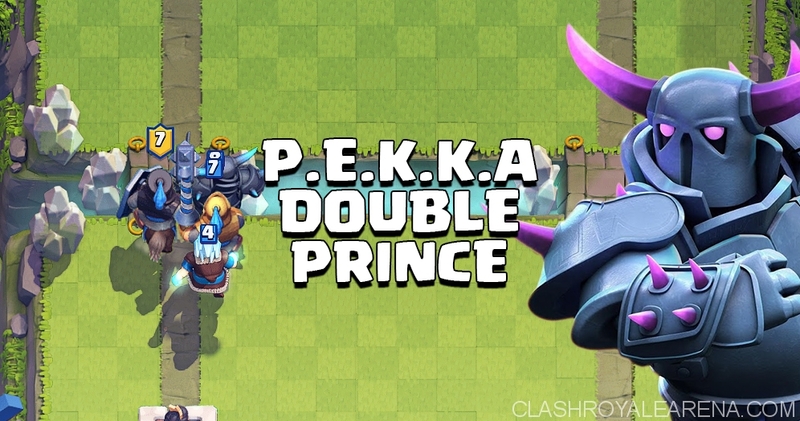 He is great support with the prince pushing the Pekka a little faster and instantly locking on targets once they are on charge state, meaning that most squishies will be quickly destroyed by this fast unit. Afterwards use him with Prince and Poison or on double elixir behind Pekka. If you were lucky enough to gain the elixir advantage this guy will be very helpful if placed as the back, gaining charge and bound to make a good elixir trade. Hard Counter to nearly everything and the main offensive card has been seeing lots of play due to the buff he has got that revived Goison decks that have been waiting for a while. He is the hard counter to the cards we are unsure about, e.g a Hog is not guaranteed to be killed with Dark Prince or only Guards so we may have to use this guy to strike down an incoming Hog. Use him with Poison or Zap for a counter attack or if they have used a lot of elixir and have a lack of squishies. Afterwards use him with Dark Prince and Poison or on double elixir behind Pekka. The Glass cannon of the deck gains us a lot of time with repetitive stun for us to get the elixir to play the other cards of the deck that don’t cost a lot. Also a key card of Pekka decks, against some bait decks or hog cycle decks (and the upcoming return of Trifecta) with inferno towers or inferno dragons (which is a card that is being kicked out of the meta) he will leave no worries about our tank dying and also is well protected as behind the bursting push, any units use to distract him will evaporate. He could be used against other Prince decks and gain us advantage on them easily and quickly, making us the greater the double prince user and advantage for the for-game. These are here to support you against small pushes and many cards that are not worth using princes or ewiz to counter. These little guys are also useful in blocking many hits from other powerful hitters while our own ones destroy them. Aerial decks are under-used so this card is not vital to protect. 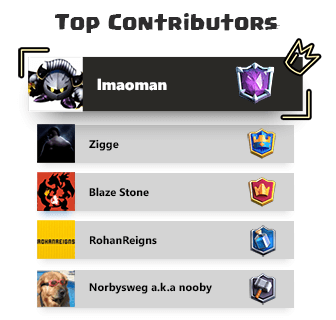 It will be supporting the bridge section when mini-tanks and squishies are placed behind the pekka and princes to get their attention or destroy our Ewiz. 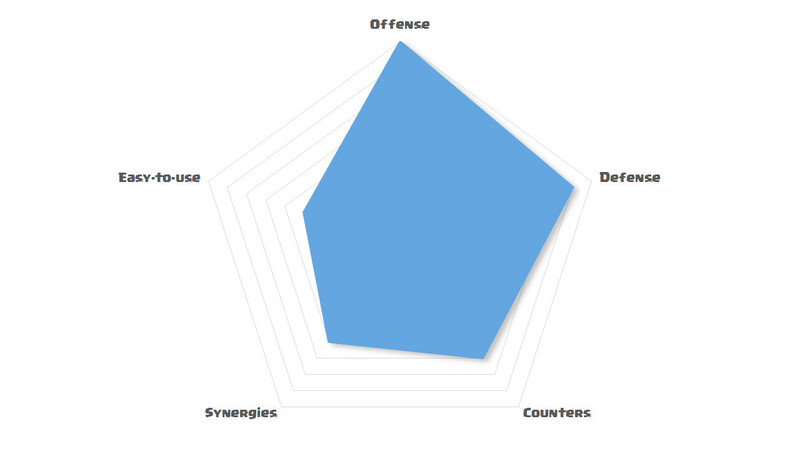 It is also very helpful to guards when there is a mediocre push e.g Hog with ice golem and spirit, Ram with Gang etc. A pretty self explanatory card, using it on squishies, making the job of poison of minions and goblins even faster. It is also good to gain advantages in battles like Pekka vs Pekka or a similar push and this deck has burst damage so the delay that Zap causes the enemy, they are pretty much burnt. Also good to use on inferno units if our Ewiz has successfully been destroyed and disrupted. This card is a very important card so we must make sure on what we will use it on and which choice is the most useful. 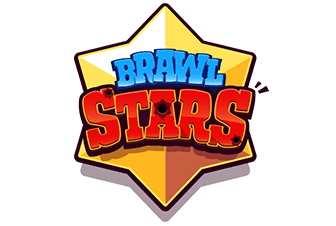 Cutting down glass cannon pests, all the squishies and gaining advantages when our opponents start spamming cards as they cannot defend against the mega push. You need to stall as much as possible, track elixir and make sure you don’t get a huge disadvantage. Hide pekka unless necessary, make counter attacks that will get us good elixir trades. Start Pekka from the back and building up double Prince, Mega Minion and Ewiz supported by Poison. If the opponent also starts an attack at the other lane than use Guards to stall a bit and the DPS of the P.E.K.K.A and Princes will already drill the King Tower if it is not stopped. These will need lots of crafty ideas to stall and control the hogs, use counterattacks to force out elixir and don’t lose the elixir advantage against these guys. If you managed to stall to x2 elixir, our pekka push will deal with any sort of cycling push. 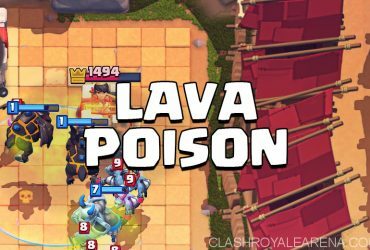 Use value poisons on the splits, zap to finish off the double Musketeers and P.E.K.K.A or Prince the other lane. Control your elixir usage very carefully. Start cards at the back often (Mega Minion and Dark Prince) to create hesitation. 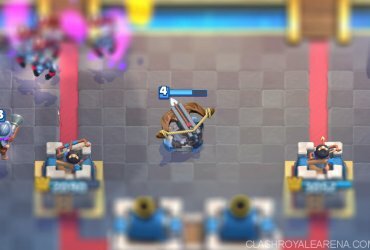 If you managed to stall to x2 elixir, our P.E.K.K.A push will deal with any sort of chip push. Pekka the Giant, stop the Prince charges and slow down with Guards and Ewiz. Counterattack as much as possible. We directly counter all edges of the classic types of the Ebarb decks. We directly counter all edges of the classic types of the RG decks. Mega Minion becomes important, power it with Zap and Ewiz and you’re pretty much safe on the ground. We directly counter all edges of the classic types of the Golem decks. Use Guards between the fight of the P.E.K.K.A so ours is not hit and theirs is dead, with our powerful cards. It should be able to drill to their defences once their tanks are gone. Salty 2v2 X-Bow Deck For Arenas 5+ – The Ultimate Chip Deck!